Consolidated Energy Consultants Ltd (CECL) is a major wind energy consultant in India providing comprehensive Technical Services exclusively to the emerging field of Renewable Energy Sources with core area being conversion of Wind Energy to produce pollution-free electricity. 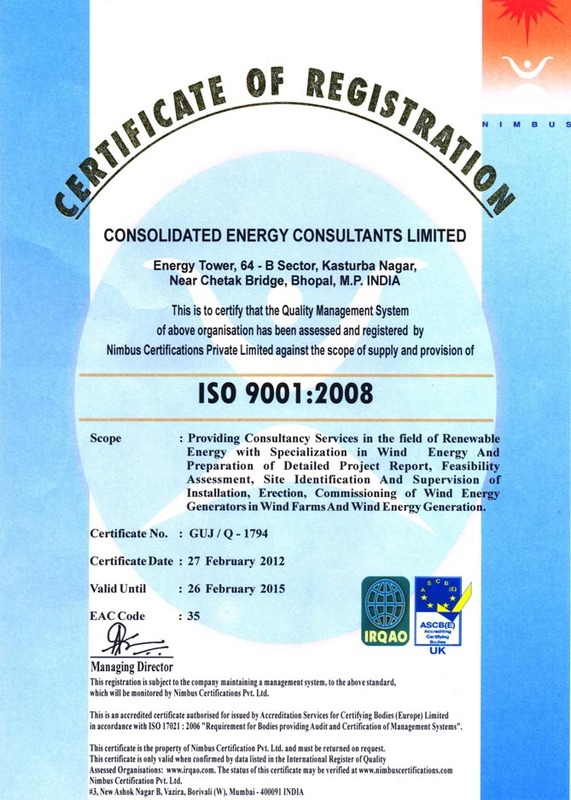 CECL has been associated with Wind Energy Programme in India from day one. CECL has been actively associated as a prime wind energy consultant with activities such as Site Identification, Wind Resource Assessment, Micro-siting, Energy estimation, Validation, Feasibility studies, Detailed Project Report preparation, Design and Engineering, etc. CECL also provides services of Due diligence, procurement and contracting, Project management, Monitoring etc. CECL also has been working on the formulation of policies, preparation of Master Plans, study of Investment potential etc. for the entire panorama related with Wind Power generation for large size grid connected generators to wind-diesel hybrid system and even smallest stand-alone battery charger. CECL has provided various consultancy services for wind energy projects from conceptualization to implementation as also on formulation of strategic plans in harnessing wind power. With a huge clientele of over 350+ private, government, PSU and banking organisations, over undeterred services of 30+years, CECL stands as one of the top rated consultancy and services organisation. CECL has been associated with the State Nodal for formulation and implementation of wind energy projects, virtually in all the windy states – ANERT Kerala, GEDA Gujarat, KREDL Karnataka, Lakshadweep Administration, MEDA Maharashtra, MPUVN Madhya Pradesh, NEDA Uttar Pradesh, NEDCAP Andhra Pradesh, OREDA Orissa, REDA Rajasthan, TNEB Tamil Nadu and WBREDA West Bengal. On request from MEDA CECL also prepared a strategic plan to promote Wind Power Programme in the State of Maharashtra and made a presentation to Maharashtra Electricity Regulatory Commission (MERC). Renewable Energy and Energy Efficiency Partnership (REEEP) has registered CECL as partner of REEEP. CECL has also been registered as a Service Provider for Carbon Finance at the World Bank. CECL is closely associated with COWIconsult, the largest Consultancy Organization in Denmark and is also a member of consortium of consultants approved by European Union. CECL has been publishing Directories on Indian Wind Power ever since 2001 annually which provides comprehensive information at one place, pertaining to wind power in India. Besides having internationally acclaimed softwares, CECL has developed on its own a number of softwares to ensure grid compatibility and financial viability. In the vast energy sector, electricity constitute a small fraction. Even in this small area, renewable energy constitutes a much smaller segment. Operating in this limited orbit we do not try to produce large waves but attempt to create ripples which would hopefully reach even the most under -privileged person in the farthest corner. We firmly believe that ultimate relevance of all technological developments lies in bringing about improvement in the quality of life. Pioneer : Ever since we happened to be the first consultant in Wind Energy Sector in the country 33 years ago – we constantly endeavour to think much ahead, anticipate the requirement of the sector and get ourselves geared up. It is now an obsession for us to remain a pioneer. Committed : Our commitment to deliver and complete the assignment within time is only one of the important factors. In totality it covers our commitment to stay in the clean-energy sector and achieve sustainable energy security. Ethical: To maintain ethics in our business and commercial dealings is only a matter of routine. More importantly we ensure quality of the service we provide to our clients in particular and society in general. Though primarily our core-expertise is on technical issues yet it is neither fair nor possible to remain in different to Financial/Commercial aspects. A purely financial consultant can not truthfully indicate the financial results which very widely due to variable features – more particularly the widely variable generation. Commercial Wind Power Projects are still at nascent stage of development and orientation of stake holders is a necessity for popularization. CECL organized Business meets, Investors meet and Interactive Sessions for various types of stakeholders to motivate them. In long term interest of the new technology, orientation Programmes are conducted for Engineering Students – as there are no text books and/or regular courses. Our objective is not only upgradation of knowledge and skill within the organization but also to disseminate the acquired knowledge – which increases through sharing. Producing electricity from Wind and other Renewable Energy Sources and feeding them to the grid would largely benefit the need of Industry and Urban population. We however feel equally concerned about the need of agriculture and vast rural population living in remote corners.Decentralized power generation through locally available resources is needed urgently. We surveyed, designed and executed the first project under “Village Energy Security Programme” (VESP) launched by Ministry of New and Renewable Energy (MNRE), Govt. of India at Village Kasai in Betul District of M.P. The strategy was to harness locally available resources. We have recently accepted a challenging assignment to scientifically assess the wind resource and develop large number of projects in North-Eastern States, Leh & Ladakh based on Wind-Solar Hybrid Concept. Success of this project shall meet the long standing need of people living in difficult area where grid supply can never be ensured.Towards our commitment to ensure Energy Security in true perspective – we are continuously experimenting with Stand-Alone Battery Charging, Biomass Gasification and Wind-Diesel Hybrid Systems. CECL shall continue to explore new ideas and concepts to ensure total Energy Security both in terms of availability and affordability. The country has expressed deep concern on environmental protection and through National Action Plan on Climate Change (NAPCC) firm commitment has been made to substantially increase usage of pollution free renewable energy. For Generators of Conventional Power it is now mandatory to produce clean energy. This has already created a substantially large demand for Wind Power Projects. Further through introduction of unique and innovative scheme of Renewable Energy Certificate (REC), trading of Wind Power is now possible at a remunerative rate – which would make WPPs – commercially viable. This market boom would keep us busy for years to come. On consideration of market demand – we have already ventured into identification and development of sites for large projects. Substantial lumpsum earning through disposal of these sites shall be invested to own Wind Turbines and create a separate stream of regular revenue earning. Re-powering of old wind farm shall now be a new feature and we have already provided services in this regard. Demand for our services in this new activity is likely to increase in near future. At national level, substantial budgetary allocation has been made for decentralized power systems in remote corners of the country. Our services has already been retained by Govt. of India to implement Wind Solar Hybrid Systems in North East, Leh and Kargil. This would not only enhance business prospect but would also help us to ensure energy security in true perspective. Most comprehensive wind energy services are being offered in all related technical aspects of Wind Power Projects (WPP) from Concept to commissioning – and beyond. The skill is constantly upgraded through acquisition of recent data base and latest Computer Softwares. It is a continuous process of knowledge upgradation to meet the exacting requirements of the sector.